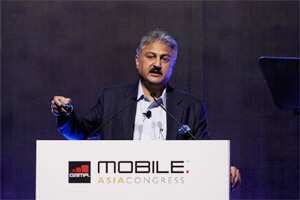 Sanjay Kapoor, CEO for India and South Asia at Bharti Airtel Ltd., speaks at the GSMA Mobile Asia Congress in Hong Kong on Wednesday. Bloomberg. Hong Kong: Competition in India’s mobile market will remain intense, with the overcrowded 15-player sector in need of consolidation to lift margins, a senior executive at market leader Bharti Airtel Ltd said on Wednesday. Sanjay Kapoor, Bharti’s chief executive for India and South Asia, also said the company saw an increase in the uptake of third-generation (3G) services it launched earlier in 2011, although mass adoption of premium services would take time. Call prices have since stabilised -- Bharti and some rivals, including Reliance Communications Ltd and Vodafone Group Plc’s local unit, raised prices by about a fifth earlier this year. Kapoor said competition was “fairly intense" when it came to acquisition of new subscribers and that many of Bharti’s rivals were sacrificing profits in the race. “The Indian market is still the most competitive market in the world. Otherwise, why would the bulk of the operators work at prices that are much below their costs?" he said on the sidelines of a conference in Hong Kong. “How many players are there whose prices cover their entire costs? Very few. (The rest) are virtually losing money to participate in the market." The Indian government is working to ease rules for telecommunications mergers and acquisitions to facilitate industry consolidation, a move seen as positive for companies such as Bharti, which were hit after the country issued more telecom licences in 2008. “Consolidation is inevitable," Kapoor said. “The number of players competing in the market has to drastically go down ... so that will happen. Whether it happens through acquisitions or through closures and walkouts, or it happens in any other form is a matter of debate," he said. Bharti has previously said it would not be averse to making acquisitions in India. Companies including Bharti launched 3G networks in 2011 after spending billions of dollars to buy airwaves in a state auction last year and are betting on the pick up of premium data services to improve margins, although the initial response has been lower than expected. “Creating an ecosystem for a 3G type of technology takes time," Kapoor said, adding that he remained optimistic on the potential of broadband in the market where less than a tenth of the population use Internet. Earlier in November, Bharti reported a bigger-than-expected fall in quarterly profit. The decline was its seventh consecutive quarter of profit drop, amid higher interest costs, foreign exchange losses and its money-losing African operations. Bharti had 7 million 3G customers in India, with a quarter of them using the services regularly, Kapoor said earlier this month. The company also owned permits for fourth-generation wireless services in four zones and planned to launch networks based on the TD-LTE technology before the end of the current fiscal year to March.